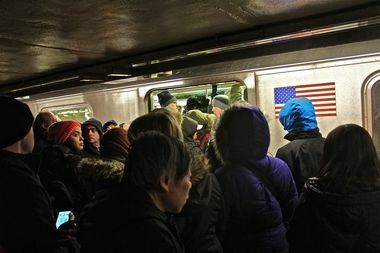 Crowds packed subway platforms and trains in Union Square as cold weather wreaked havoc on a recent morning commute. FOREST HILLS — You're not imagining it — your commute has been off the rails recently. Delays increased on most subway lines in 2014, with about 20 percent of all trains on the tracks arriving late to their stations and medium and major delays increasing sharply, according to MTA records. The problem was the worst on the 5 train, which saw 32 percent of its trains delayed. The news coincides with a fare increase this past weekend, taking the basic fare on the system to $2.75. Experts are divided on what's been bringing your ride to a screeching halt, with MTA officials pointing to a surge in ridership and commuter advocates blaming a lack of funding for needed infrastructure repairs. The number of trains with medium to major delays climbed to 12.5 percent in 2014, up from 10 percent the previous year, the MTA said. The MTA measures delays by the difference between the expected and actual time between trains, MTA officials said. Trains that are expected to arrive in five minutes, but show up in 10, for instance, doubling that time, are considered to be major delays. Expected arrival times vary between lines and different times of the day. A medium delay is for a wait of 50 percent or more of the expected arrival time. Anything less than that is considered minor. The tardiest lines in 2014 were the 5 and 6, where 32.5 and 31 percent of trains respectively were delayed, the MTA said. That's up from 29.3 percent for the 5 and 23.3 percent for the 6 the previous year. Moderate and major delays comprised most of the tardiness on both lines with 22.6 percent of 5 trains arriving 50 to 100 percent later than they were supposed to, officials said. For the 6, that figure was 22.5 percent. "There's always something with the 5," said Marie Lewis, 32, who was waiting in Union Square to catch a 4 or 5 to her job as a school social worker. "There are huge delays in the morning. They say there are signal malfunctions all the time. It's aggravating. It's worse than ever. I'm a half-hour late when I take that line." Others on the platform with Lewis agreed. "The 5 stinks. There are always signal malfunctions, something going on on the platform, train congestion," said Scott Williams, 40, who was commuting from Brownsville to Bronx Community College. "It's a big problem. It's killing me." The lines with the fewest delays, aside from the shuttles, were the D and L in 2014, which both saw decreases in the percentage of tardy trains. The G and the C, the lines with the fewest delays in 2013, both saw an increase in tardiness. Straphangers said they are fed up with the delays. "The F train is always a problem. It's always delayed," said Jessie Dong, 45, as she waited to take the train from Forest Hills-71st Avenue to her real estate office near Rockefeller Center. In 2014, 29 percent of F trains arrived later than they should, up from 24.7 percent in 2013. Dong said if the trains are running well she can get to work in 20 minutes. But her commute can turn into an hourlong nightmare when the train sits in the tunnels between stations. "It makes me always late. I actually started to leave home earlier now because of the F train," Dong said. "I expect delays." "Are we seeing increased delays? Yes we are. The main reason is increased ridership," MTA spokesman Kevin Ortiz said. Along with general population growth, Ortiz said people are relying less on their cars and using the subway to get to work and recreation. Average daily subway ridership jumped to 5.5 million in 2013, the highest figure since 1949, according to the MTA's most recent data. The 2013 weekend ridership of 5.8 million surpassed the highest total ever in 1946. Ridership in both areas was about 130,000 lower in 2012. The single-day-ridership record was broken five times in September 2014 as ridership climbed over 6 million, officials said. "The amount of the time it takes for a train to pull into a station, open the doors and let passengers on and off increases with ridership," Ortiz said. The MTA could soon deploy platform "conductors" and painted "step aside" boxes near subway doors to help move people into subway cars and ease delays. But those fixes don't go far enough according to John Raskin, executive director of the Riders Alliance, a grassroots subway and bus rider advocacy group. "Riders are seeing delays and technical problems and crowding that remind people of the bad old days in the 1980s. That's not the direction we should be going," said Raskin, who faulted outdated equipment. "The MTA, unfortunately, has only enough funding to put Band-Aids on the problem. We need new funding to buy new equipment and modernize the system," he said. The MTA and transportation advocates have pressed state and local officials to fully fund the MTA's $32 billion five-year capital plan, which currently has a $15 billion shortfall. Along with helping maintain tracks and electrical substations, that money would help the MTA launch the second phase of the Second Avenue subway, a project that could ease delays on the 5 and 6 by shifting some riders to the new line, Ortiz said. The funding would also allow the MTA to implement a system, communications-based train control, which could run trains closer together, allowing more to fit on the rails, officials said. The L already uses it and it's expanding to the 7, but officials also want to install it on the B, D, E, F, M and R lines. Raskin said it's clear to many riders that the subway system is under duress. The 7 line recently suffered major delays in February due to ice on the rails. On Monday, a broken rail disrupted L train service from Brooklyn to Manhattan for more than three hours. There have also been numerous delays due "signal problems," "rail conditions" and switch problems. "We've heard from our members that subway trains have gotten noticeably worse this last month," said Raskin, whose group is collecting subway rider horror stories to send to Gov. Andrew Cuomo to convince him to fund the MTA's capital budget. Meanwhile, subway riders are feeling the crunch. "People try to get in even though there is no space inside," said Joanna Felicjancik, who was catching the F at the Roosevelt Avenue station in Jackson Heights on her way to her Midtown accounting job. "They have to get to work and they are late, so they keep trying to get in."